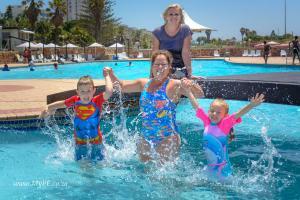 Children and adults can get a jump-start on their summer holidays with “Aunty Bubbles” who will be giving swimming classes at MacArthur Baths from Thursday to Friday, December 10 to 18. Water safety is paramount during the summer months, both for people living at the coast and visitors to coastal resorts. In addition swimming pools, rivers and dams require thought and care to avoid problems. These classes take a number of forms, with a focus on fun and swimming – learning about water and water safety. Participants don’t need to be able to swim well, or even at all, to be a part of the club. To take part in the holiday club, a place must be booked by contacting Lerryn Mew at tel. 082 325 9815 for more details regarding times and lesson slots.